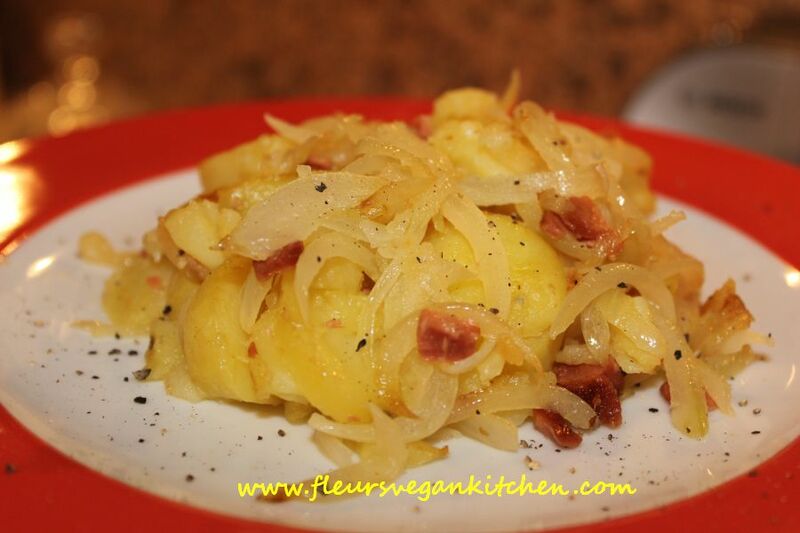 Home / Posts tagged "retete cartofi"
For 4-6 servings: 1 kg potatoes 2-3 large onions, finely sliced 100 g smoked vegan bacon (or smoked tofu), finely cut 2 – 3 tablespoons olive oil salt and pepper, to taste Peel the potatoes and boil them whole. Drain the water and cut the cooked potatoes into slices. Heat the oil in a saucepan and add the onions. Fry on medium heat, stirring occasionally, until the onions soften. Add the vegan bacon (or smoked tofu), potatoes, salt and pepper. Stir occasionally, taking care not to crush the potatoes. It is ready when the potatoes are slightly browned. Serve as side dish and/or with salad (in the picture below are served with sauerkraut German style). 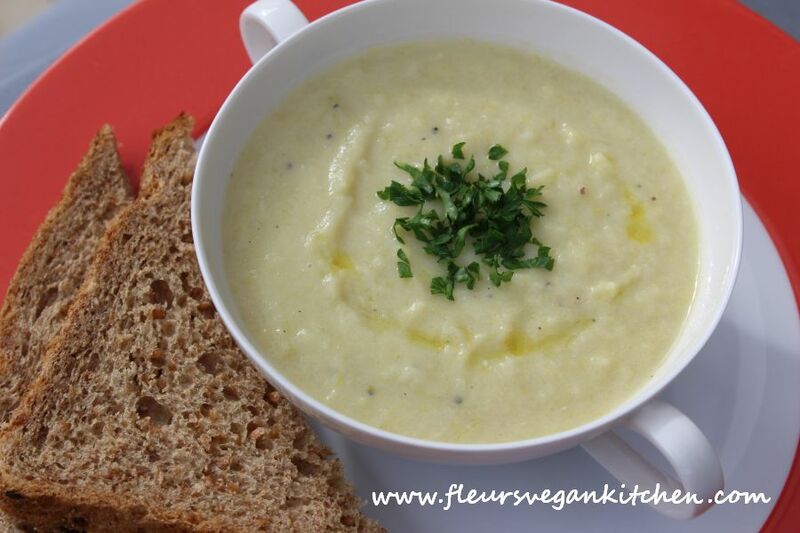 For 4-6 servings: 1 onion, finely chopped 2 large leeks, sliced 3 medium potatoes, cubed 1 cup unsweetened soy milk 1 tablespoon olive oil salt and pepper, to taste parsley or chives, for garnish Heat the oil in a soup pan and add the onion. Stir fry for about 2-3 minutes then add the leeks. Cover and simmer for a few minutes, stirring occasionally. Add the potatoes and 3 cups of water. Cover and simmer. When the vegetables are cooked add the soy milk, salt and pepper. Let it cook for 1-2 minutes. 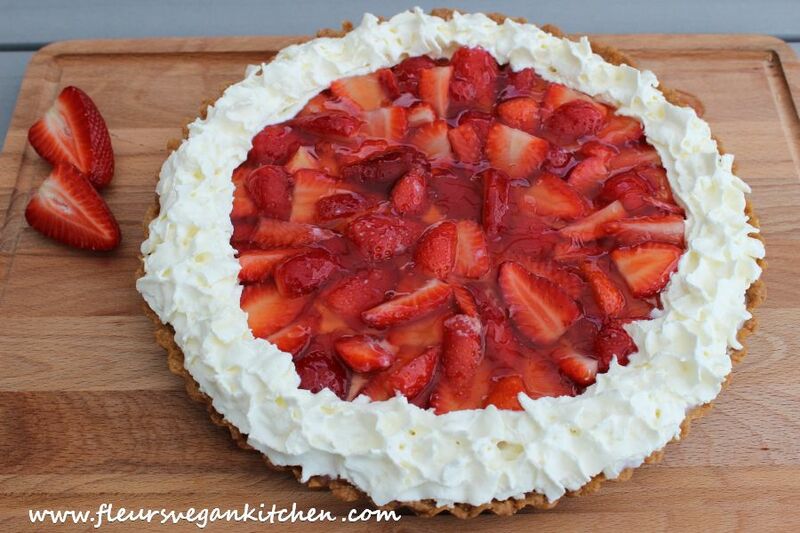 Blend/process until you get a smooth cream. 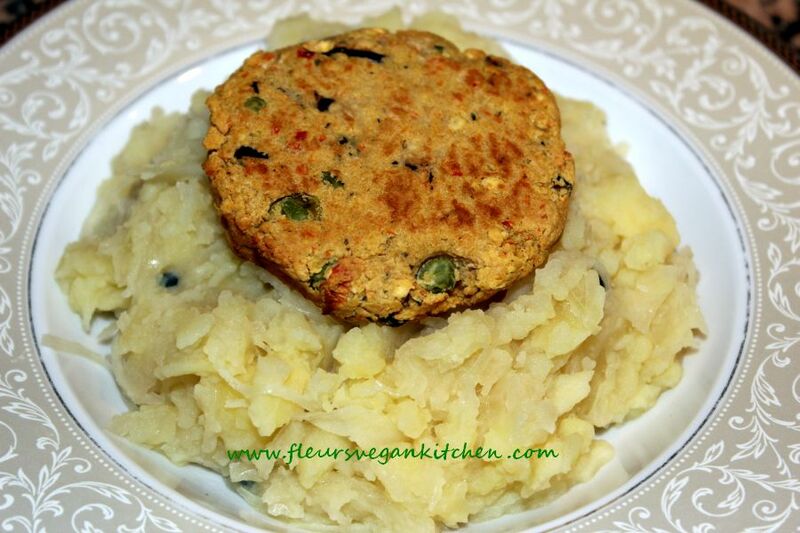 Garnish the dish with finely chopped parsley or chives . Serve cold or warm. 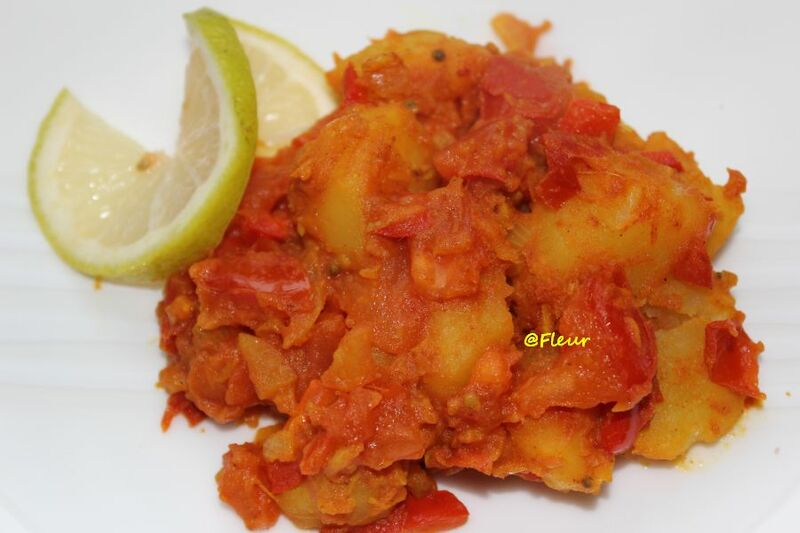 For 4 servings: 1 kg potatoes, cut lengthwise in 4 2 bell peppers, sliced 1 onion, finely chopped 2 tomatoes, finely chopped (or 2 tablespoons tomato puree) 4-5 garlic cloves, finely sliced 2 teaspoons paprika powder a pinch of cumin 1 tablespoon oil salt and pepper, to taste Stir fry the onion in oil for 2-3 minutes. Add the bell peppers, potatoes, paprika powder, cumin and water enough to cover the potatoes. Cover and simmer on medium heat, stirring occasionally. 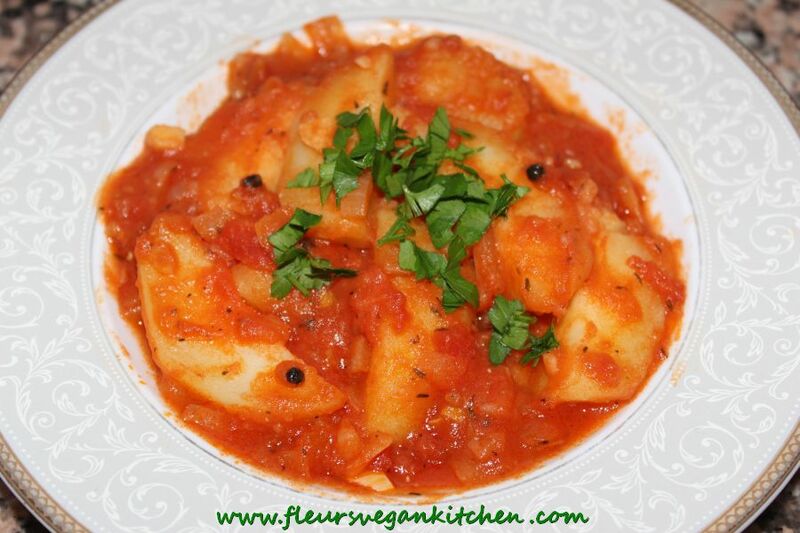 When the potatoes are almost cooked add the tomatoes (tomato puree) and garlic. Add salt and pepper to taste. For 4 servings: 1.5 kg new potatoes a garlic head, finely chopped 1 tablespoon rosemary (fresh or dried) 3 tablespoons olive oil salt and pepper Wash and boil the potatoes whole, unpeeled, for 10 minutes. Cut in half or quarters. 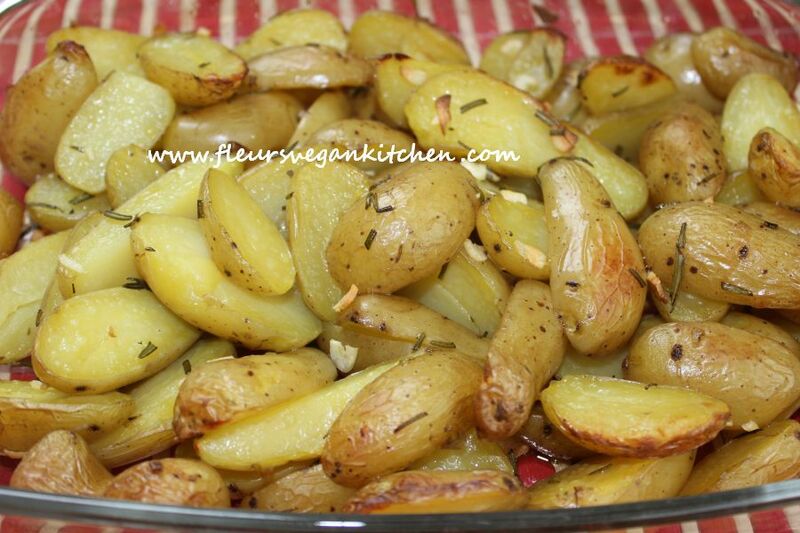 Put the potatoes in an oven tray, add the garlic, rosemary, olive oil, salt and pepper to taste. Mix well and bake at medium heat until brown and crispy. Serve as side dish and/or with salad. Per serving: 100 g tempeh, sliced ​​approx. 0.5 cm thick For the marinade: 2 teaspoons soy sauce 1-2 cloves of garlic, mashed 1/2 teaspoon dried thyme 1/2 teaspoon dried oregano 1 teaspoon olive oil pepper, to taste Mix all ingredients. Pour over the tempeh and let it marinate in the refrigerator for at least 2-3 hours. 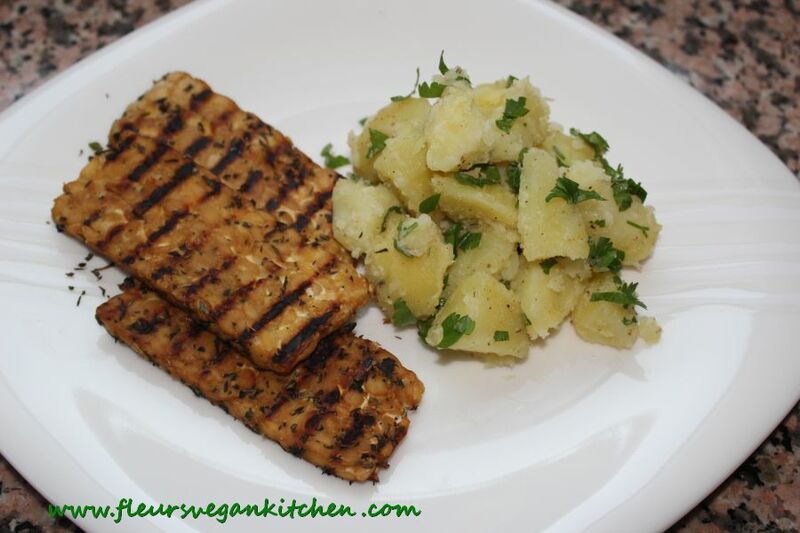 Heat the grill and grill the tempeh for a few minutes on each side. For the potatoes: 150-200 g potatoes, peeled and cubed parsley, finely cut 1 teaspoon olive oil salt and pepper, to taste Cook the potatoes in water with a pinch salt. Drain and mix carefully with the other ingredients. 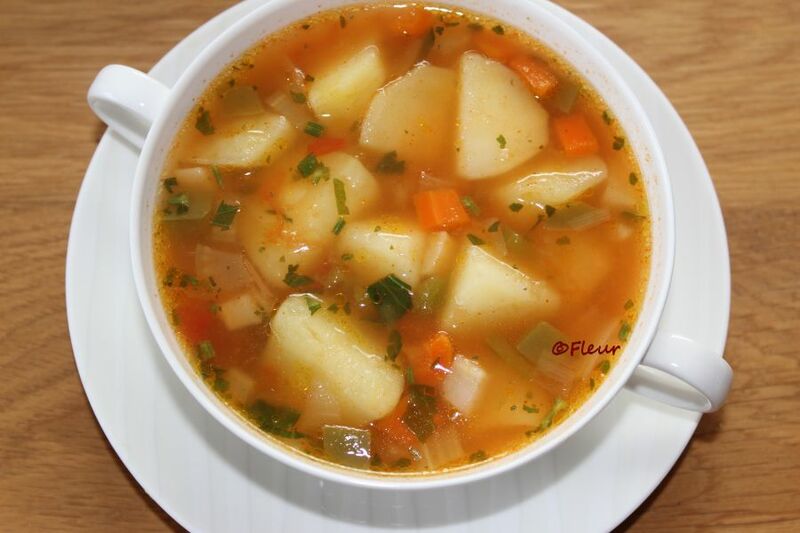 1 kg potatoes, cubed 250 g soup vegetables (onions, carrots, peppers, parsnips, celery, etc. 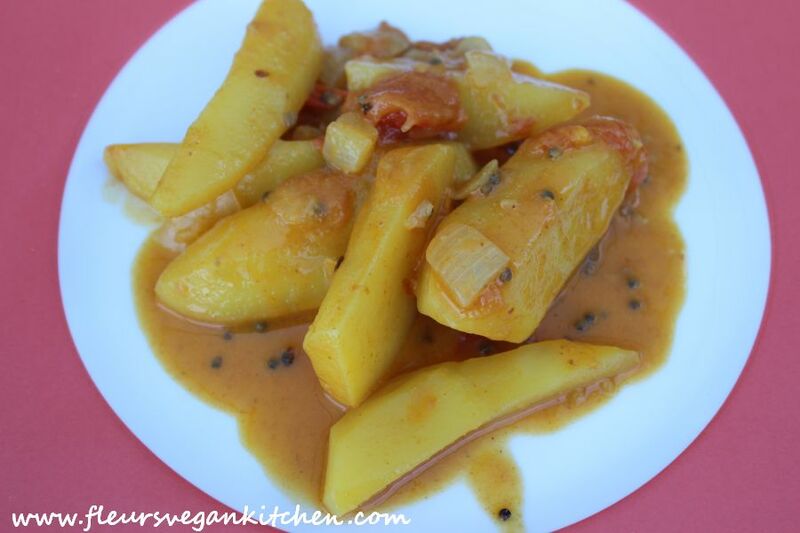 ), chopped 2 tomatoes, finely chopped 1 teaspoon paprika powder lemon juice, to taste (optional) lovage/parsley 2 tablespoons olive oil salt, to taste Cook the potatoes together with the onions, in enough water to cover. When the potatoes are half cooked add the other vegetables. Cook for 5 minutes then add the tomatoes. 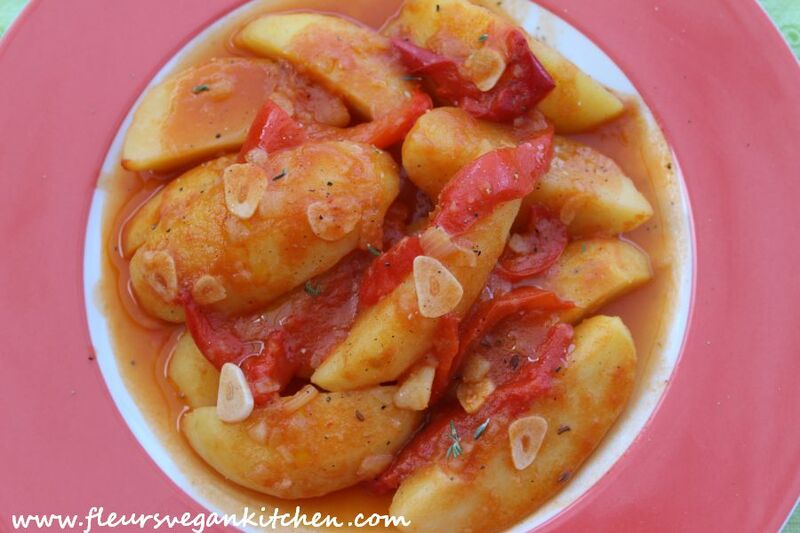 When the tomatoes are cooked add the lemon juice and more water, the paprika powder and salt to taste. Garnish with fresh lovage/parsley and olive oil.